This is a great \\\"fakeout takeout\\\" meal! Make it low-carb with some cauliflower rice! In a large saucepan or skillet, whisk the coconut milk, curry paste, curry powder, ginger and garlic powder. If your coconut milk has separated in the can, it will become smooth again when it heats up. Stir in the bell pepper slices, peas, shredded carrots and beef strips. Let cook for about 15 minutes, allowing the beef to cook through, the veggies to soften and the flavors to mingle. 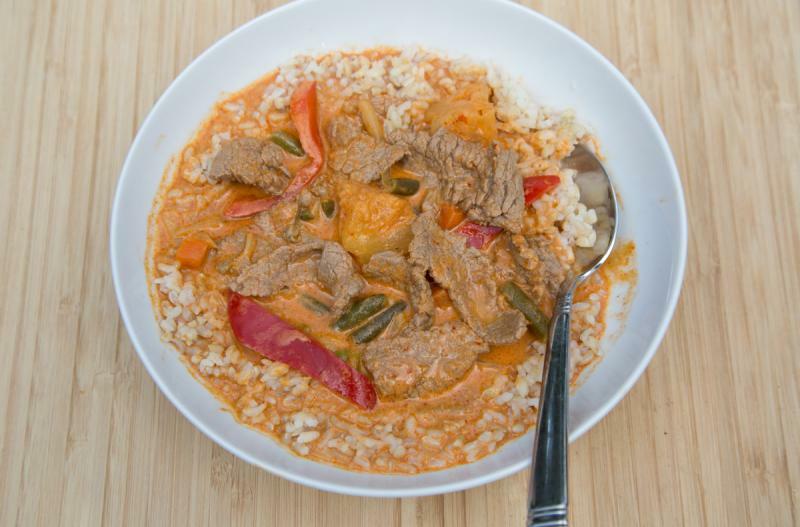 Serve Beef Red Curry over rice with optional cilantro and green onion garnish. Slice 2 red bell peppers. Whisk together 4 – 15 oz. 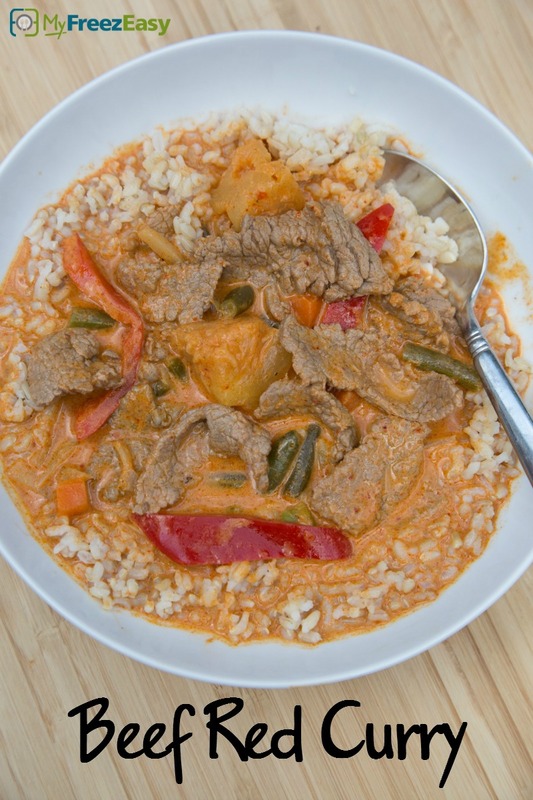 cans light coconut milk, 6 Tbsp red curry paste, 2 Tbsp curry powder, 2 tsp ground ginger, and 2 tsp garlic powder. Open and drain 2 cans of peas. Put baggie in the freezer and freeze up to 6 months in fridge freezer or 12 months in a deep freezer. Thaw in the fridge overnight, or a warm bowl of water for about 20 minutes before cooking in skillet or saucepan. Thaw and add contents to the skillet or saucepan. Bring to bubbling and then reduce to low and simmer for 15 minutes or until beef is cooked through.